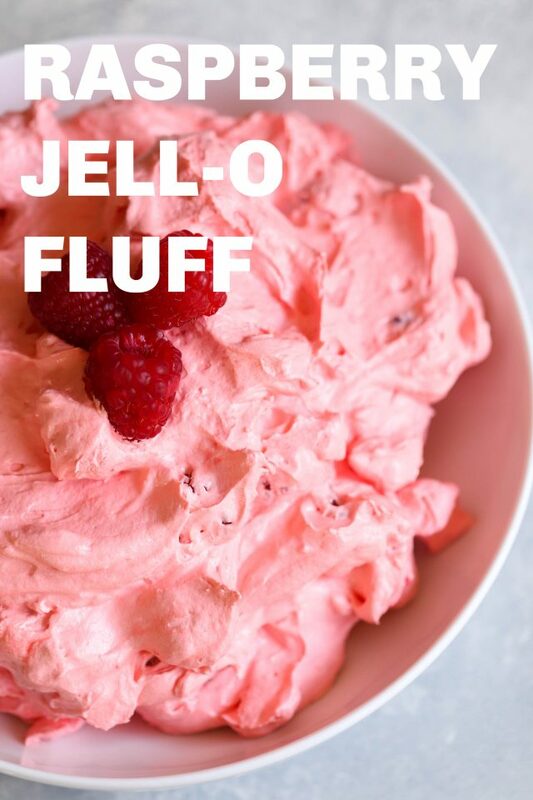 Light and fluffy, this Raspberry Fluff Jell-O Salad only has 5 ingredients and comes together in a matter of minutes. It's the perfect light dessert or even side dish at your potluck party. Jello salad is a staple at our family gatherings and holiday dinners and this recipe is going to quickly become your favorite! We have all kinds of Jello Fluff Salads on our blog: Orange Fluff Salad, Raspberry Cheesecake Fluff Salad, Blueberry Fluff Salad, Strawberry Jello Fluff Salad, 5 Minute Fluffy Yogurt Fruit Salad, and our 5 Minute Pistachio Salad. 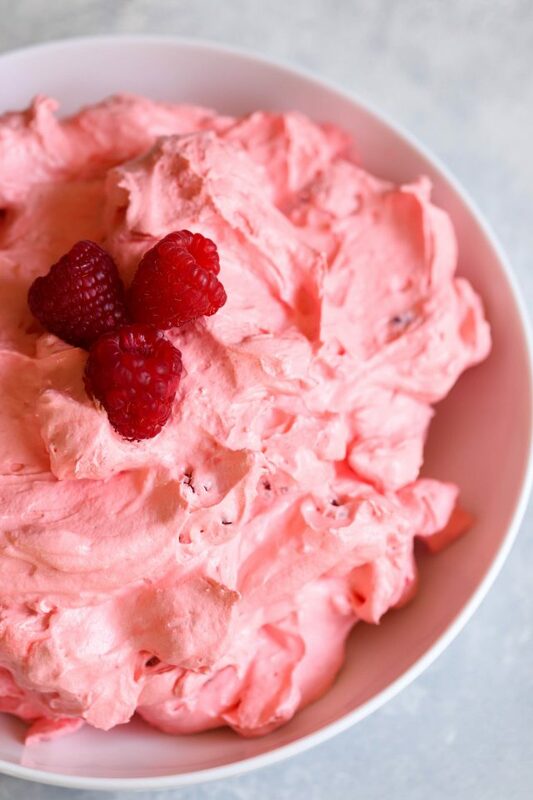 I think that, out of all the fluffy salads on our blog, this raspberry one is my favorite! I have written this recipe to make 10-12 servings, but you could easily cut it in half (use the small boxes of jello and only one 8 ounce container of Cool Whip) if you need less. Why is this called “Fluff”? The texture of this salad is light and fluffy! Some people even add in marshmallows, which adds even more to the fluffiness of this dish. Step 1: Add the box of pudding (make sure you use cook and serve, not instant!) and the box of Jello to a saucepan. Pour in the water and lemon juice, then bring to a boil over medium heat. Step 2: Once it comes to a rolling boil, remove saucepan from heat and pour Jello mixture into a large bowl. Step 3: Cover bowl with plastic wrap and place in the fridge. Let jello set for 1-2 hours. 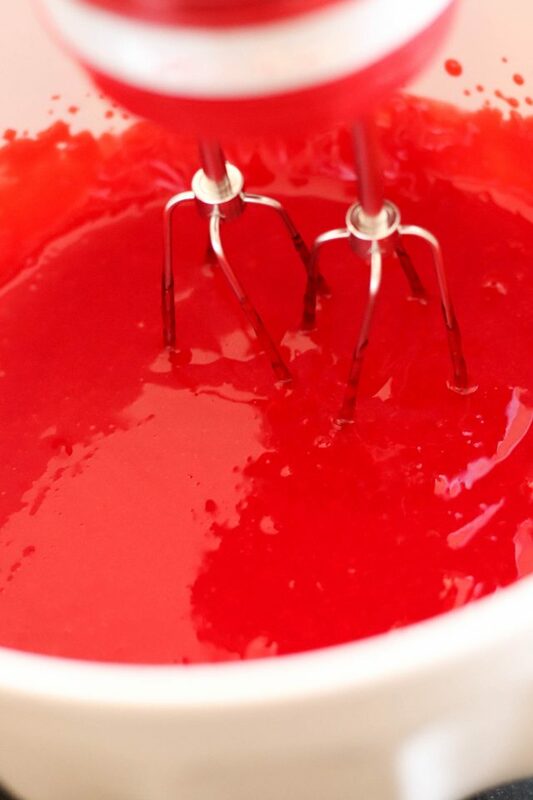 Step 4: Beat jello with an electric mixer until it because creamy, then fold in the Cool-Whip and berries. Step 5: Let chill in the fridge for at least 1 hour before serving (you can serve it immediately, but it has a chance to set up more if you let it chill for that 1 hour before serving). To be honest, I wouldn’t recommend making it more than 1 day in advance. I find that the juice from the raspberries will make the salad runny (especially if you used frozen raspberries). For best results, make this salad the same day that you plan on eating it. Can you make this with sugar-free jello and pudding? I have not made this salad using sugar-free jello or pudding, but in everything that I have read about sugar-free jello, it should still work out great for this recipe! 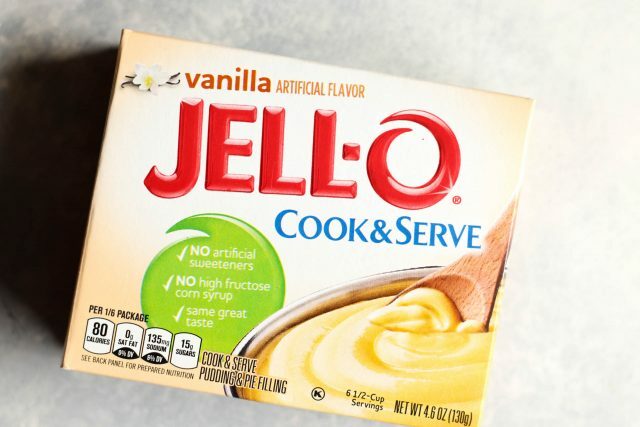 If you try it with sugar-free jello, leave a comment below and let us know how it worked. Can you make this with fresh whipped cream instead of cool whip? I have never tried making this recipe without cool-whip – the cool whip is needed to get that fluffy texture. If you use fresh whipped cream, I am afraid that you will not get the same fluffy consistency and this recipe will not turn out the way that it’s supposed to. If you are looking for a homemade Cool-Whip alternative, check out this recipe for Stabilized Whipped Cream – it has a more similar fluffiness to Cool-Whip. Try our Strawberry Fluff Jello Salad! This salad is made just a little differently, but both versions are delicious. This is one of my favorite salads to make in the summer with fresh berries, and it is the perfect dish to take to potluck dinners or BBQ's! 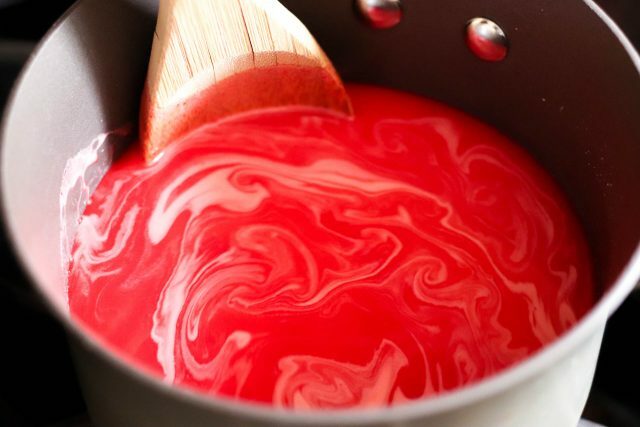 Mix together pudding, Jell-o, water, and lemon juice in saucepan over medium heat until it boils. Once it comes to a full rolling boil, remove from heat and pour into large bowl. Cover with plastic wrap and refrigerate until mixture has thickened (about an 1-2 hours). With an electric mixer, beat jello until creamy. 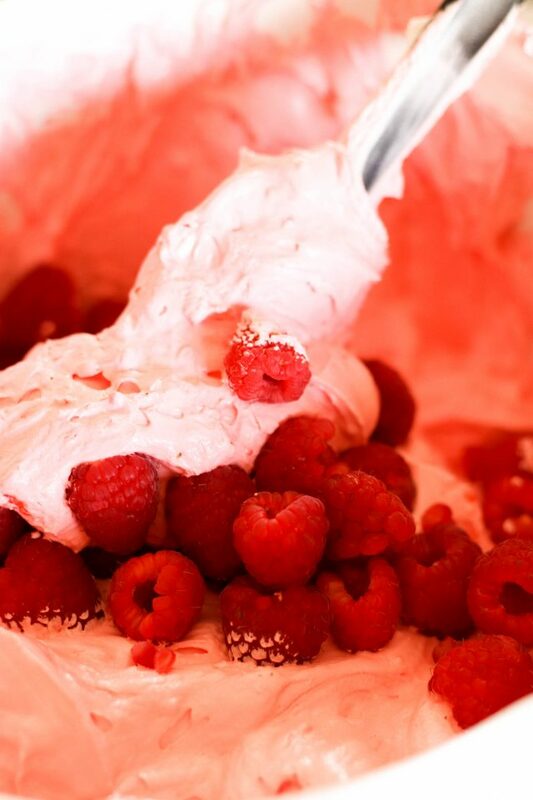 Gently fold in Cool Whip and raspberries until completely mixed together. Stick back into the fridge and chill for about an hour before serving. I was looking for this recipe earlier today and just barely noticed that it is on here! Hallelujah! Great cooking minds think a like!! 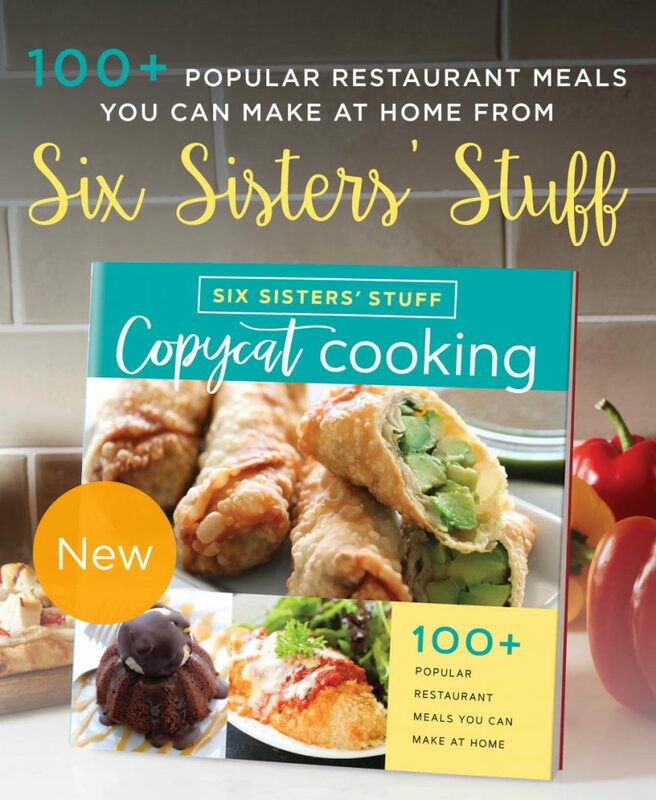 i am looking forward to making this. i just have one question...the pudding doesn't come in a 6oz box. is it just the large box of pudding? Tammie I used 1 and half boxes of the large pudding since they don't make it in 6 oz. It turned out yummy! Do you know if this can be made with sugar free pudding and jello? I am so sorry- I have never tried this with the sugar-free pudding or jello and I am not sure if it works or not! Let us know if you try it! I only have one container of cool whip do you think I could also use homemade whipped cream or does it have to be cool whip? How far in advance would you make this? Is it best to prepare and serve right away after it's chilled for an hour? Or can I make it a day before?